• Measurements of the incoming and outgoing bandwidth. • Measurements of the bandwidth used by individual IP addresses. • Measurements of the bandwidth used by individual applications. • Measurements of bandwidth across external interfaces, or bridges, or both. • Drill down through the report from application bandwidth into IP address bandwidth, and vica versa. 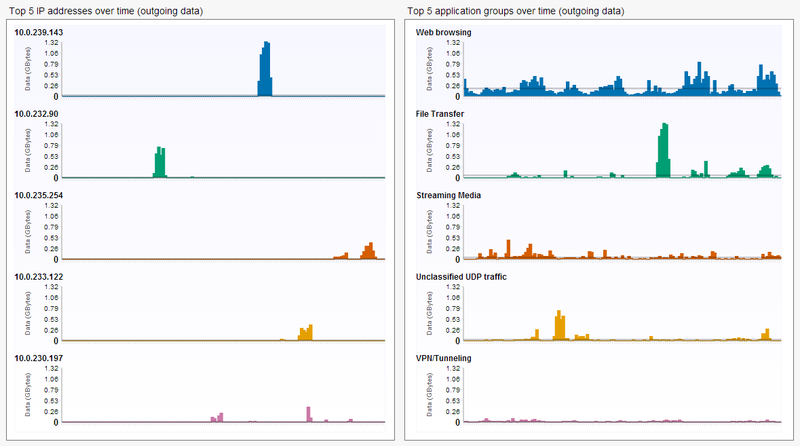 • Application classification into groups, and bandwidth measurements of these groups. The following knowledge base article contains a detailed description of the currently available application groups — How does Smoothwall Classify Layer 7 Applications? Note: A Layer 7 license (deep packet inspection) is required to run this report fully. Without this, limited information is available. For more information, contact your Smoothwall representative. • Traffic statistics — Shows the incoming and outgoing bandwidth as a graph, over the specified date range. • Top 5 IP addresses over time — Shows the bandwidth used, as a graph, for each of the top five IP address. Incoming or outgoing data is shown, dependent on the traffic direction chosen when running the report. 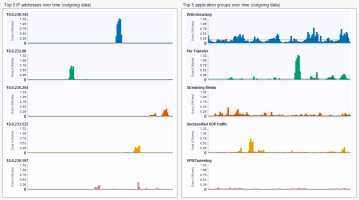 • Top 5 application groups over time — Shows the bandwidth used, as a graph, for each of the top five application groups. Incoming or outgoing data is shown, dependent on the traffic direction chosen when running the report.